Just reposting some old post here and wondering why nothing has changed in up to date Ireland. Those were the old days when the Irish were literally starving, like the Indians in British crown ruled colonial India, or native Americans in the American Colonies, or native Australians, who starved to death in their own lands in the millions. This murder of natives occurred not by chance, it was by English Crown colonial design, because of, the direct consequences of the greed of a few hundred Colonial elite, those stealing terrorist colonials who under command and protection orders of the so called English (not they ever were English) Royal Crown, simply took all via deceit and terror or threat of. The English crown franchise that stole millions in resources and via the effective native enslavement. Enabling for a few leaders of the British Colonial terror franchise, a lifestyle of petty kings, were able to live in splendour like petty kings as they ignored the natives they were stealing from dying of hunger living like dogs. That was all in the past, well we all hoped or thought or logically assume in our so called Republic! Anyway No! I am not referring to the obscene reality in 21st Century Ireland, of the so called hereditary Fishing rights of the likes of the so called Duke of Devonshire in our so called Republic of Ireland! No I mean and for example: how French trawlers are allowed under the European Union laws to catch more fish in Irish waters than Irish trawlers. The European Union like the old British colonial empire - redefining the word native through their so called laws! 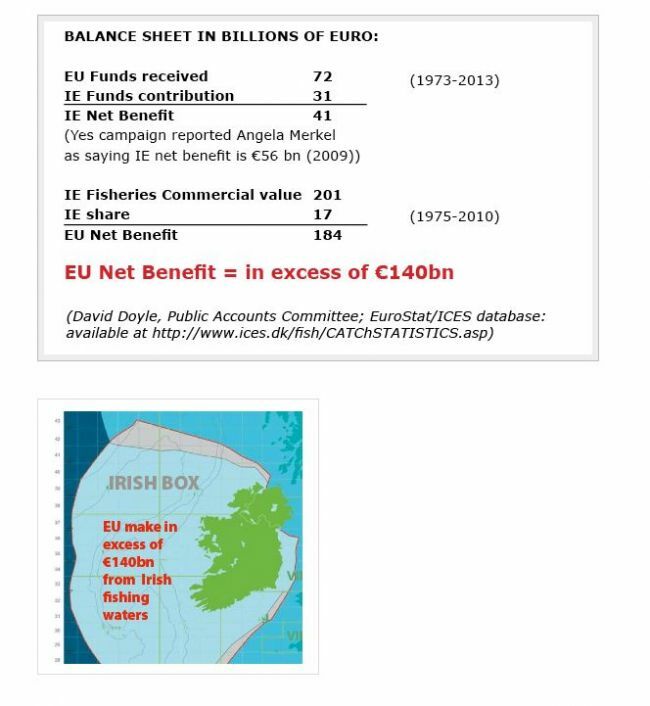 French trawlers have ten times the quota of Irish fleets and they can fish in Irish seas. Which means Foreigners once again have more effective rights than the natives. Ireland should be the richest country in Europe with the majority of Europe�s oil and gas and fishing waters, as well as the richest mineral deposits. The Duke who is content to be called by his common names of ...Peregrine Andrew Mornington Cavendish ...recently declared that aristocracy is dead. He remains never the less ...a very controversial foreign land owner in Ireland. The Duke of Devonshire owns vast estates in the Republic Of Ireland. ...20 miles of the River Blackwater and a huge swathe of Youghal Harbour ....and has thus far successfully seen off several legal challenges to the hereditary estates. Most controversially ....the Duke claims he owns the river beds of the Republic of Ireland ....and therefore the lucrative and highly sought-after fishing rights ....on his vast claimed stretch of the river. The ownership row has resonance of both a class dispute ...and a hangover from Britain's colonial times in Ireland.